Bump for KillerX so he can bookmark this thread. Proud Member and founder of the DOWN SOUTH SUNNY WINTER PICK ON SNOW PEOPLE COALITION! ok heres a question! when ordering from colemans, right now i have the original struts but im going to upgrade them in the future (Kyb or others)...should i get the 7" Coil-Over Kit (2.04 I.D.) or the 2.08 (pretty sure the 2.04 will work with kybs and mine but wanna make sure.) also for these springs i jsut call up summit and tell them i want 300lbs 12" springs with a 2 5/8" ID? Brad, the 2.04 ID sleeves fit over my KYBs fine. I didn't measure my factory struts but they are sitting in my garage, so I'll measure them when I get home. For the rear of my 88 I got the 12" 170lb/in springs (factory rate on 88's rear is ~150lb/in. pre-88s are way different). Brad, on the 88 factory struts there is a washer-like part at the top of the strut body where the shaft exits. These piece is too wide to allow the threaded coilover sleeve to fit. My KYBs have a much smaller piece that had a smaller diameter than the strut tube itself. You'll need to grind down this portion to allow the sleeve to fit. Steven Snyder, hey thanks for the info....but i have the 1985 not the 88 will these still work? even better. when I did my 88 the washers just under the mount plate were much bigger than the 84-87 year. I had to go get some from an earlier car at the junk yard. once you get your struts off where you can see them it will be easy to see what to do. Yes, those pictures from fierohoho were of a pre-88 strut. You will still need to do the trimming as mentioned but they will work fine otherwise. 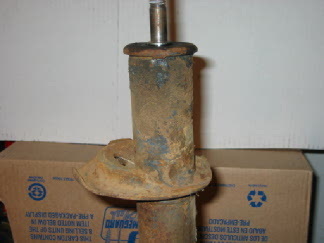 The OEM strut body is the same size for all years. The KYB replacement struts I purchased were for 84-87 Fieros so when you get your KYBs you will be using the same setup as myself. I have 12" springs and it looks like I would run out of suspension travel way before the adjustable perch hits the bottom of the strut. This is the type of info that should stay at the top. Please tell me no one actually does this with factory struts. Not only were they junk to start, but they're useless after these years. Ok So I got the 7" sleeve with a 10" spring... what strut should I get that will work with this? also do you guys have part numbers from the places too? I went with 5 inch adjusters and 12 inch springs. 350# Eibachs to handle the weight of the big block. In reply to the factory struts thing. I really doubt very many of us still have the origional struts. These cars are 20 years old. The adjusters cost about $40 shipped with springs you can throw away cause they are crap. Just get a CRX coilover kit. They fit, and you get enough parts for 2 fieros. The eibachs are $49 ea. new. Throw in some good struts and you will be under $250 still I'm sure, and that's with 2 adjusters left over. what strut should I get that will work with this? KYB and Monroe replacement struts have been confirmed to have the same outer diameter and will work properly with the commonly available threaded sleeves. Gabriel struts, being another standard factory replacement, also probably have the same outer diameter. Konis are larger diameter and you must have the strut housings modified or the threaded sleeves modified to fit them together properly. Be very very careful when removing the spring perches to use those sleeves. You definitely do not want to cut into the strut housing! So, has anyone done this using Konis? I looked in the archives and found a couple comments about Konis being larger at the top due to their rebuildable feature. So regular sleeves won't fit. Anyone got any pics/specs of the Koni top section? Check with MinnGreenGT, I believe he is running Koni's on his car with coilovers. ha ha ha Nice thanks guys! Do you guys have part numbers? for KYB and/or Monroe? 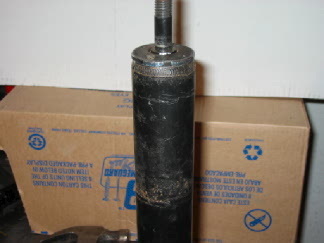 or places to buy them "cheap"
84-88 rear struts: KYB 234005 ("GR2"). For 88s you may need to grind into part of the mounting area of the strut for spindle clearance. If you have factory 88 struts you will see the cutout that is missing from the 84-87 replacement struts such as the 234005. If not, just install the strut temporarily and try to adjust to max camber. If you can't get the adjustment bolt to go to its maximum camber setting you need to trim. You'll see a mark on the strut where the spindle and strut collided. Just dremel away until it clears. The best price I found was from www.pickproparts.com, but there are certainly other dealers with similar and perhaps better prices. So what spring rate is reccomended as a good place to start with early chassis, 88 cradle, 3800sc, man trans? I'm thinking about ordering 300-350, just not sure which end is better to start at. I have no problems getting another set of springs, but the closer the first time, the better. The car is pretty stripped down, and aimed more towards handling than comfort..
300 should be fine from what I'm told. That's beautiful! Money well spent, I think. John that is a really nice looking setup. Is that $140 for 2 chrome plated springs and 2 adjustable threaded perchs? Something like that, I don't remember for sure and the receipts are at the shop. You can go to Speedway Motors and price out what you want yourself. They have a very large selection of whatever you might want.............and then some. They aren't the cheapest, but they are next day to me for regular UPS ground rates and I've never had anything backordered, unlike Jegs. I e-mailed Speedway asking them a few questions and I have to say they were no help what so ever! Yeah I'd like to hear about how to do coilovers on Koni's too. Anyone want to tell the story? As far as Konis go, they do require more modification than normal struts, but they still work. You have to disassemble them and either turn the cap nut down to a small enough diameter to fit inside the threaded sleeve or put the threaded sleeve on and then put the cap nut back on. You'll also need to turn down the strut body right below the cap nut just a bit. www.colemanracing.com has 2.040 sleeves that make this easier. I have been told that Koni on a Fiero are just as good as the upper style KYB and the KYB is alot cheaper in price. Does anybody know the spring rate of the rear WS6 stock springs? Just to have a relative comparison. What questions did you ask? They're not exactly a Fiero Specific vendor. They cater to the people that know what they want, but this isn't rocket science so I'm wonering what it is you need to know that hasn't already been asked and answered in this thread. I asked them if they carried a front shock that would fit the Fiero and if there was a large size diff. between each outer dia. from one strut to another. Does Koni still honor the warranty on the struts if that work is done by a qualified machine shop? If not, do you know if there is anyway to have coilover Konis without voiding that sweet lifetime warranty? Speedway sells parts to two groups of people. The first is the one they've made their living on for decades and that's the circle track cars. Not many Fiero's in that group. More recently, they've gotten into street rod stuff. Not many Fiero's there. They don't handle normal, replacemant parts like Monroe, etc. They handle Aldan, Carrera, etc., for the street rod guys and the circle burners. I guess I wouldn't be surprised that they wouldn't know what shock a Fiero took or even that they didn't know the size difference between struts, since they don't sell either one. The strut sizes have been mentioned several times in this thread and, since it's about coil overs, the front shock questions didn't come up, unless you're thinking of front coilovers in which case that would depend on the kit or how you were doing it yourself, hardly something anyone here could know. The tone of your post suggested that you expected Speedway to know the answers to questions that they would have no reason or business knowing, IMHO. If you want to view them negatively for that, then have at it. I won't. You won't find better service anywhere in the country and if you want good quality and quick shipping, they're your folks. Well I am getting ready to order the springs and struts here soon but I have one question. My question is I need a nice KYB strut to match, any ideas? I was thinking this may work out nice? I haven't really desided on where to get the coil over package just yet but have desided on the size. 7" threaded, with a 10" X 2 5/8 ID and a 250 LBS. rating. After all these years they still work great...!